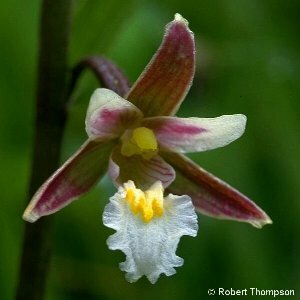 Marsh Helleborine (Epipactis palustris) is a rather scarce plant of lowland marshy alkaline ground such as fens, wet dune-slacks and flooded railway cuttings. 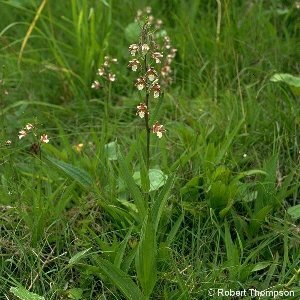 The plants have about half a dozen narrow leaves and a one-side flower spike of between four and twenty flowers. The flowering period stretches from June to September and the flowers are pollinated by bees; they have a whitish lower lip and the rest of the flower is tinged reddish or brownish. There is a creeping rootstock below the soil surface enabling the plant to spread over large areas of ground.